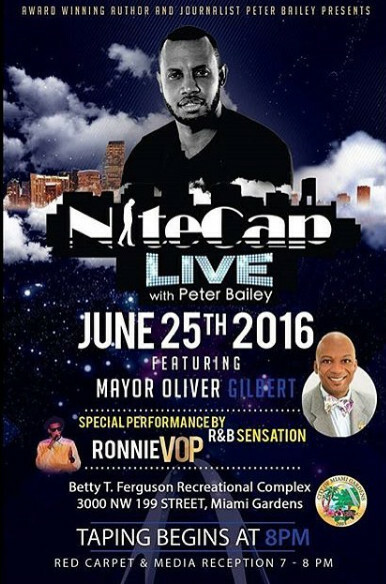 Award-winning author and journalist Peter Bailey brought his critically-acclaimed live talk show "NiteCap Live" on June 25th to Miami Gardens where he engaged in a conversation with Mayor Oliver Gilbert about the future of Miami Gardens. Peter Bailey debuted scenes from his upcoming film "Miami Gardens: A Love Story", in which a city leader is torn between the love of a woman and his community. #NiteCapLive is a space for communities to come together to understand each other & empower themselves & this wknd at #NiteCapLiveinMiamiGardens the community did just that. Here's a recap. Stay tuned for our NiteCap Live featuring Oliver Gilbert, Mayor of Miami Gardens.